Even Tucker Carlson, MSNBC's uninhibited house libertarian, was a bit taken aback. But good Dem Bill Press has had the, um, gumption to say what others may have thought about Hillary Clinton: that she has "balls of brass." 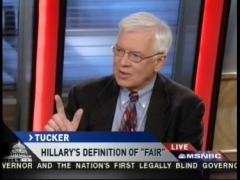 Press's comment came on this evening's Tucker in the course of a discussion of Clinton's shameless assertion that the Michigan primary was "fair" despite the fact that the DNC had agreed it wouldn't count and that Obama's name did not even appear on the ballot. TUCKER CARLSON: You know this term "Orwellian"? Everything's "Orwellian." But rarely do you hear a statement that is in fact Orwellian. That actually reaches the threshold of "war is peace," "hate is love" and it's this right here. Hillary Clinton talking about the Potemkin primaries in Michigan and Florida and saying this: "If you're a voter from Florida or Michigan, you know that we should count your votes. The results of those primaries were fair and should be honored." They were fair in Michigan? Barack Obama was not on the ballot! After a bit of conversation about the politics of the situation with Press and Pat Buchanan, talk returned to Hillary's chutzpah. CARLSON: Not to play shrink, but just for 30 seconds. Think about what it takes in order to say something like that with a straight face, maybe with a hint of a smile, into a camera, with no irony of any kind. "The election in Michigan was fair." Imagine being able to say that! What kind of person could do that? PAT BUCHANAN: I worked for one, Tucker. CARLSON: Pat, just for the record, Pat was a long-time employee of Richard Nixon. PRESS: I was just going to say, it takes someone with balls of brass. CARLSON: OK, well, your characterization, not mine.